This presentation will focus on an R&D project aimed at exposing high school students to contemporary mathematics by periodically sharing with them Math News Snapshots (MNSs). Metaphorically speaking the idea is to take high school students on a glass bottom boat tour over the deep, colorful, vivid, often stormy mathematical ocean, for 45 minutes, once a month or so. The rationale, the definition of MNS, MNSs development, and results of their implementation will be discussed. You may wish to take a few minutes to familiarize yourself with the website. 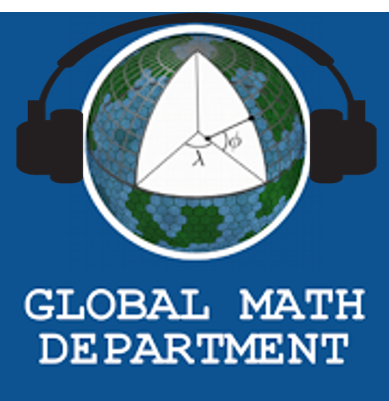 Last week the Global Math Department took a break. Don’t forget – recordings for all previously held webinars can be found here. I recently saw a tweet from Heather Dodge about her fantastic estimation bulletin board. I really like how interactive bulletin boards can bring mathematics outside of the classroom and into the broader school community. They help to create a positive culture of mathematics in a school. Heather’s tweet made me think of the other examples of mathematics bulletin boards I’ve seen or heard about. Some math activities just seem to be a great fit for a spot in the hallway. Kim Figura shared an example of a Which One Doesn’t Belong bulletin board and Danielle Marchandshared her Year Game bulletin board. Interactive bulletin boards seem like a great way to promote mathematical conversations and inspire collaboration. Tracy Zager, in her book Becoming the Math Teacher You Wish You’d Had, wrote “Mathematicians frequently talk about standing around blackboards or whiteboards together, thinking and talking. […] This particular kind of collaboration – standing, talking, thinking and writing – is so inherent to doing mathematics that many buildings are designed around it.” If you don’t have space for a whole bulletin board… no problem. How about just posting a math puzzle or problem in the hallway? Sara VanDerWerf wrote a great blog post about how she experimented with this and the surprising results she saw. Read her post Even if they say they don’t like doing math, they secretly do. An Experiment you should try. Jenise Sexton gifts us with a brief, yet powerful post to reflect on the relationships we have (or don’t) with students. In here post, The Push Without Relationships, she shares a few experiences and practical bits of advice. These three quotes from her post say a lot about the impact of relationship. But wait, there’s more… go read her post. It’s not too late to create positively impactful relationships with your students. It’s been a week since NCTM in San Diego, but many observed that this meeting felt different. Some have even blogged about their experience, including first-time blogger, Hema Khodai. Reading her piece, entitled Virtual Strangers, gave me the confirmation that relationships first formed through social media can indeed be the support that sustains us. Hema shouts out the #ClearTheAir community and its intersection with math educators. And, she acknowledges that she received something she perhaps did not expect to receive: a sense of belonging. As we think about what we want in math spaces, I think her blog is an important piece of that puzzle. No more spoilers. Please read. Copyright © 2019 Global Math Department, All rights reserved.